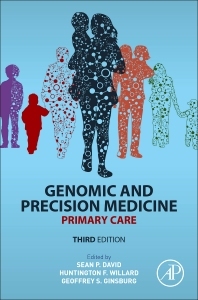 Genomic and Precision Medicine: Primary Care, Third Edition is an invaluable resource on the state-of-the-art tools, technologies and policy issues that are required to fully realize personalized health care in the area of primary care. One of the major areas where genomic and personalized medicine is most active is the realm of the primary care practitioner. Risk, family history, personal genomics and pharmacogenomics are becoming increasingly important to the PCP and their patients, and this book discusses the implications as they relate to primary care practitioners. What Do Healthcare Providers Need to Understand to Implement Genomic Healthcare? Dr. David is a family doctor and physician scientist interested in translational research to improve preventive health and public health strategies to improve population health.